Google Chrome Blog: Eggnog, mistletoe and... pigs? team, we’ve cooked up a few early holiday presents for you. Starting today, you can play a new episode of your favorite game, with 42 exciting levels. And if you are handy with the slingshot, you’ll also be able to find a few new hidden Chrome dimension levels. 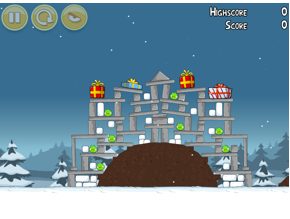 In addition, you can check out the first of an additional set of 25 holiday-themed Angry Birds levels. A different level will be unlocked every day until December 25th. There are also three Chrome-exclusive holiday levels that you can unlock with a secret password. And finally, don’t worry if you get stuck on a tough level; you can now summon the Mighty Eagle to the rescue from within Angry Birds. Just click the Eagle icon at the top and turn all pigs into bacon. Not using Chrome but still want to play? 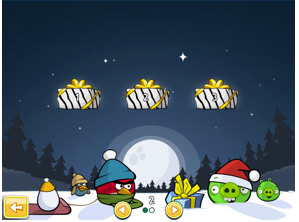 Install Chrome with Angry Birds and make sure those pigs get only coal this year. With the help of the Angry Birds team, we’ve cooked up a few early holiday presents for you.